Matthew Calbraith Perry[Note 1] (April 10, 1794 – March 4, 1858) was a Commodore of the United States Navy who commanded ships in several wars, including the War of 1812 and the Mexican–American War (1846–48). He played a leading role in the opening of Japan to the West with the Convention of Kanagawa in 1854. Perry in the 1850s, in a photograph by Mathew Brady. Perry was interested in the education of naval officers, and assisted in the development of an apprentice system that helped establish the curriculum at the United States Naval Academy. With the advent of the steam engine, he became a leading advocate of modernizing the U.S. Navy and came to be considered "The Father of the Steam Navy" in the United States. Matthew Perry was the son of Sarah Wallace (née Alexander) (1768–1830) and Navy Captain Christopher Raymond Perry (1761–1818). He was born April 10, 1794, South Kingstown, R.I., U.S. His siblings included Oliver Hazard Perry, Raymond Henry Jones Perry, Sarah Wallace Perry, Anna Marie Perry (mother of George Washington Rodgers), James Alexander Perry, Nathaniel Hazard Perry, and Jane Tweedy Perry (who married William Butler). His mother was born in County Down, Ireland and was a descendant of an uncle of William Wallace,:54 the Scottish knight and landowner who is known for leading a resistance during the Wars of Scottish Independence and is today remembered as a patriot and national hero. His paternal grandparents were James Freeman Perry, a surgeon, and Mercy Hazard, a descendant of Governor Thomas Prence, a co-founder of Eastham, Massachusetts, who was a political leader in both the Plymouth and Massachusetts Bay colonies, and governor of Plymouth; and a descendant of Mayflower passengers, both of whom were signers of the Mayflower Compact, Elder William Brewster, the Pilgrim colonist leader and spiritual elder of the Plymouth Colony, and George Soule, through Susannah Barber Perry. In 1809, Perry received a midshipman's warrant in the Navy, and was initially assigned to USS Revenge, under the command of his elder brother. His early career saw him assigned to several ships, including USS President, where he served as an aide to Commodore John Rodgers. President was in a victorious engagement over a British vessel, HMS Little Belt, shortly before the War of 1812 was officially declared. Perry continued aboard President during the War of 1812 and was present at the engagement with HMS Belvidera. Rodgers fired the first shot of the war at Belvidera. A later shot resulted in a cannon bursting, killing several men and wounding Rodgers, Perry and others. Perry transferred to USS United States, commanded by Stephen Decatur, and saw little fighting in the war afterwards, since the ship was trapped in port at New London, Connecticut. Following the signing of the Treaty of Ghent, which ended the war, Perry served on various vessels in the Mediterranean. Perry served under Commodore William Bainbridge during the Second Barbary War. He then served in African waters aboard USS Cyane during its patrol off Liberia from 1819 to 1820. After that cruise, Perry was sent to suppress piracy and the slave trade in the West Indies. Later during this period, while in port in Russia, Perry was offered a commission in the Imperial Russian Navy, which he declined. Perry commanded USS Shark, a schooner with 12 guns, from 1821 to 1825. In 1763, when Britain possessed Florida, the Spanish contended that the Florida Keys were part of Cuba and North Havana. Certain elements within the United States felt that Key West (which was then named Cayo Hueso, meaning "Bone Key") could potentially be the "Gibraltar of the West" because it guarded the northern edge of the 90 miles (140 km) wide Straits of Florida—the deep water route between the Atlantic and the Gulf of Mexico. In 1815 the Spanish governor in Havana deeded the island of Key West to Juan Pablo Salas of Saint Augustine. After Florida was transferred to the United States, Salas sold Key West to American businessman John W. Simonton for $2,000 in 1821. Simonton lobbied the U.S. Government to establish a naval base on Key West both to take advantage of its strategic location and to bring law and order to the area. On March 25, 1822, Perry sailed Shark to Key West and planted the U.S. flag, physically claiming the Keys as United States territory. Perry renamed Cayo Hueso "Thompson's Island" for the Secretary of the Navy Smith Thompson and the harbor "Port Rodgers" for the president of the Board of Navy Commissioners. Neither name stuck however. From 1826 to 1827, Perry acted as fleet captain for Commodore Rodgers. Perry returned to Charleston, South Carolina for shore duty in 1828, and in 1830 took command of a sloop-of-war, USS Concord. He spent the years 1833–1837 as second officer of the New York Navy Yard (later the Brooklyn Navy Yard), gaining promotion to captain at the end of this tour. Perry had an ardent interest and saw the need for the naval education, supporting an apprentice system to train new seamen, and helped establish the curriculum for the United States Naval Academy. He was a vocal proponent of modernizing the Navy. Once promoted to captain, he oversaw construction of the Navy's second steam frigate USS Fulton, which he commanded after its completion. He was called "The Father of the Steam Navy", and he organized America's first corps of naval engineers, and conducted the first U.S. naval gunnery school while commanding Fulton in 1839–1841 off Sandy Hook on the coast of New Jersey. Perry received the title of commodore in June 1840, when the Secretary of the Navy appointed him commandant of New York Navy Yard. The United States Navy did not have ranks higher than captain until 1857, so the title of commodore carried considerable importance. Officially, an officer would revert to his permanent rank after the squadron command assignment had ended, although in practice officers who received the title of commodore retained the title for life, and Perry was no exception. During his tenure in Brooklyn, he lived in Quarters A in Vinegar Hill, a building which still stands today. In 1843, Perry took command of the African Squadron, whose duty was to interdict the slave trade under the Webster-Ashburton Treaty, and continued in this endeavor through 1844. In 1845, Commodore David Conner's length of service in command of the Home Squadron had come to an end. However, the coming of the Mexican–American War persuaded the authorities not to change commanders in the face of the war. Perry, who would eventually succeed Conner, was made second-in-command and captained USS Mississippi. Perry captured the Mexican city of Frontera, demonstrated against Tabasco, being defeated in San Juan Bautista by Colonel Juan Bautista Traconis in the First Battle of Tabasco, and took part in the capture of Tampico (November 14, 1846). He had to return to Norfolk, Virginia to make repairs and was still there when the amphibious landings at Veracruz took place. His return to the U.S. gave his superiors the chance to finally give him orders to succeed Commodore Conner in command of the Home Squadron. Perry returned to the fleet during the siege of Veracruz and his ship supported the siege from the sea. After the fall of Veracruz, Winfield Scott moved inland and Perry moved against the remaining Mexican port cities. Perry assembled the Mosquito Fleet and captured Tuxpan in April 1847. In July 1847 he attacked Tabasco personally, leading a 1,173-man landing force ashore and attacking the city of San Juan Bautista (Villahermosa today) from land defeating the Mexican forces and taking the city. 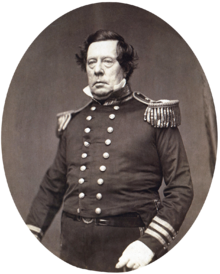 In 1852, Perry was assigned a mission by American President Millard Fillmore to force the opening of Japanese ports to American trade, through the use of gunboat diplomacy if necessary. The growing commerce between the United States and China, the presence of American whalers in waters offshore Japan, and the increasing monopolization of potential coaling stations by the British and French in Asia were all contributing factors. The Americans were also driven by concepts of Manifest Destiny and the desire to expand western civilization to what they perceived as more backward Asian nations. The Japanese were forewarned by the Dutch of Perry's voyage, but were unwilling to change their 250-year-old policy of national seclusion. There was considerable internal debate in Japan on how best to meet this potential threat to Japan's economic and political sovereignty. On November 24, 1852, Perry embarked from Norfolk, Virginia for Japan, in command of the East India Squadron in pursuit of a Japanese trade treaty. He chose the paddle-wheeled steam frigate Mississippi as his flagship, and made port calls at Madeira (December 11–15), St Helena (January 10–11), Cape Town (January 24 – February 3), Mauritius (February 18–28), Ceylon (March 10–15), Singapore (March 25–29) and Macao and Hong Kong (April 7–28), where he met with American-born Sinologist Samuel Wells Williams, who provided Chinese language translations of his official letters, and where he rendezvoused with Plymouth. He continued to Shanghai (May 4–17), where he met with the Dutch-born American diplomat, Anton L. C. Portman, who translated his official letters into the Dutch language, and where he rendezvoused with Susquehanna. Perry then switched his flag to Susquehanna and made call at Naha on Great Lewchew Island (now Okinawa) from May 17–26. Ignoring the claims of Satsuma Domain to the islands, he demanded an audience with the Ryukyuan King Shō Tai at Shuri Castle and secured promises that the Kingdom would be open to trade with the United States. Continuing on to the Ogasawara islands in mid-June, Perry met with the local inhabitants and purchased a plot of land. Perry finally reached Uraga at the entrance to Edo Bay in Japan on July 8, 1853. His actions at this crucial juncture were informed by a careful study of Japan's previous contacts with Western ships and what he knew about the Japanese hierarchical culture. As he arrived, Perry ordered his ships to steam past Japanese lines towards the capital of Edo, and turn their guns towards the town of Uraga. Perry refused Japanese demands to leave, or to proceed to Nagasaki, the only Japanese port open to foreigners. Perry attempted to intimidate the Japanese by presenting them a white flag and a letter which told them that in case they chose to fight, the Americans would destroy them. He also fired blank shots from his 73 cannons, which he claimed was in celebration of the American Independence Day. Perry's ships were equipped with new Paixhans shell guns, cannons capable of wreaking great explosive destruction with every shell. He also ordered his ship boats to commence survey operations of the coastline and surrounding waters over the objections of local officials. In the meantime, the Japanese government was paralyzed due to the incapacitation by illness of shōgun Tokugawa Ieyoshi and by political indecision on how to handle the unprecedented threat to the nation's capital. On July 11, Rōjū Abe Masahiro temporized, deciding that simply accepting a letter from the Americans would not constitute a violation of Japanese sovereignty. 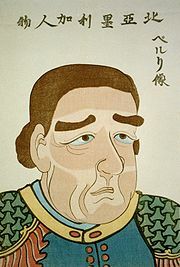 The decision was conveyed to Uraga, and Perry was asked to move his fleet slightly southwest to the beach at Kurihama (in modern-day Yokosuka), where he was allowed to land on July 14, 1853. After presenting the letter to attending delegates, Perry departed for Hong Kong, promising to return the following year for the Japanese reply. 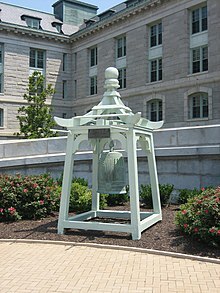 An exact replica of the Gokoku-ji Bell which Commodore Perry brought back from Okinawa, claiming it was a gift from the Ryukyu Kingdom. Currently stationed at the entrance of Bancroft Hall at the United States Naval Academy in Annapolis, MD. The original bell was returned to Okinawa in 1987. On his way back to Japan, Perry anchored off Keelung in Formosa, known today as Taiwan, for ten days. Perry and crewmembers landed on Formosa and investigated the potential of mining the coal deposits in that area. He emphasized in his reports that Formosa provided a convenient, mid-way trade location. 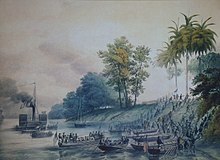 Perry's reports noted that the island was very defensible and it could serve as a base for exploration in a similar way that Cuba had done for the Spanish in the Americas. Occupying Formosa could help the United States counter European monopolization of the major trade routes. The United States government failed to respond to Perry's proposal to claim sovereignty over Formosa. To command his fleet, Perry chose officers with whom he had served in the Mexican–American War. Commander Franklin Buchanan was captain of Susquehanna and Joel Abbot (Perry's second in command) was captain of Macedonian. Commander Henry A. Adams became the Commodore's chief of staff with the title "Captain of the Fleet". Major Jacob Zeilin (future commandant of the United States Marine Corps) was the ranking Marine officer, and was stationed on Mississippi. Perry returned on 13 February 1854, after only half a year rather than the full year promised, and with ten ships and 1600 men. Both actions were calculated to put even more pressure onto the Japanese. After initial resistance, Perry was permitted to land at Kanagawa, near the site of present-day Yokohama on March 8, 1854, where, after negotiations lasting for around a month, the Convention of Kanagawa was signed on March 31, 1854. Perry signed as American plenipotentiary, and Hayashi Akira, also known by his title of Daigaku-no-kami signed for the Japanese side. Perry departed, mistakenly believing the agreement had been made with imperial representatives, not understanding the true position of the shōgun, the de facto ruler of Japan. Perry then visited Hakodate on the northern island of Hokkaido and Shimoda, the two ports which the treaty stipulated would be opened to visits by American ships. 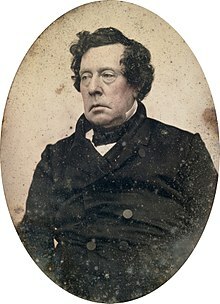 When Perry returned to the United States in 1855, Congress voted to grant him a reward of $20,000 (US $538,000 in 2019) in appreciation of his work in Japan. He used part of this money to prepare and publish a report on the expedition in three volumes, titled Narrative of the Expedition of an American Squadron to the China Seas and Japan. He was also promoted to the grade of rear-admiral on the retired list (when his health began to fail) as a reward for his service in the Far East. Perry spent his last years preparing for the publication of his account of the Japan expedition, announcing its completion on December 28, 1857. Two days later he was detached from his last post, an assignment to the Naval Efficiency Board. He died awaiting further orders on March 4, 1858, in New York City, of rheumatic fever that had spread to the heart, compounded by complications of gout and alcoholism. Living in his adopted home of New York City, Perry's health began to fail as he suffered from cirrhosis of the liver due to heavy drinking. Perry was known to have struggled with alcoholism, which compounded the health complications leading to his death. He also suffered severe arthritis that left him in frequent pain, and on occasion precluded him from his duties. Initially interred in a vault on the grounds of St. Mark's Church in-the-Bowery, in New York City, Perry's remains were moved to the Island Cemetery in Newport, Rhode Island on March 21, 1866, along with those of his daughter, Anna, who died in 1839. In 1873, an elaborate monument was placed by Perry's widow over his grave in Newport. Matthew Calbraith Perry (1821–1873), a captain in the United States Navy and veteran of the Mexican War and the Civil War. William Frederick Perry (1828–1884), a 2nd Lieutenant, United States Marine Corps, 1847–1848. Caroline Slidell Perry Belmont (1829–1892), who married financier August Belmont. A replica of Perry's US flag is on display on board the USS Missouri memorial in Pearl Harbor, Hawaii, attached to the bulkhead just inboard of the Japanese surrender signing site on the starboard side of the ship. The original flag was brought from the U.S. Naval Academy Museum to Japan for the Japan surrender ceremony and was displayed on that occasion at the request of Douglas MacArthur, who was himself a blood-relative of Perry. 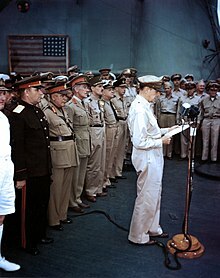 Photographs of the signing ceremony show that this flag was displayed properly as all flags on vessels (known as ensigns) on the starboard side are, with the stars in the upper right corner. The cloth of the historic flag was so fragile that the conservator at the Museum directed that a protective backing be sewn on it. Today, the flag is preserved and on display at the Naval Academy Museum in Annapolis, Maryland. The pattern for the Union canton on this flag is different from the standard 31-star flag then in use. Perry's flag had columns of five stars save the last column which had six stars. Perry's US flag was unique when it was first flown in Tokyo Bay in 1853–1854. The replica of this historic flag on board the USS Missouri memorial is also placed in the same location on the bulkhead of the veranda deck where it had been initially mounted on the morning of September 2, 1945 by Chief Carpenter Fred Miletich. In his birthplace, Newport, Rhode Island, there is a memorial plaque in Trinity Church, Newport, and a statue of Perry in Touro Park. It was designed by John Quincy Adams Ward, erected in 1869, and dedicated by his daughter. He was buried in Newport's Island Cemetery, near his parents and brother. There are also exhibits and research collections concerning his life at the Naval War College Museum and at the Newport Historical Society. There is a Perry Park in Kurihama which has a monolith monument (dedicated July 14, 1901) to the landing of Perry's forces. Within the park there is a small museum dedicated to the events of 1854. Admission is free, and the museum is open from 10 a.m. to 4 pm, seven days a week. Matthew C. Perry Elementary and High School can be found on Marine Corps Air Station, Iwakuni, Japan. The U.S. Navy's Oliver Hazard Perry-class frigates (purchased in the 1970s and 1980s) were named after Perry's brother, Commodore Oliver Hazard Perry. On December 2, 2008, Secretary of the Navy Donald C. Winter announced that the ninth ship of the Lewis and Clark class of dry-cargo-ammunition vessels would be named USNS Matthew Perry for Commodore Perry. 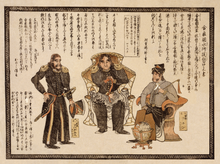 Japanese woodblock print of Commodore Perry, c. 1854. The caption reads "North American" (top line, written from right to left in Kanji) and "Perry's portrait" (first line, written from top to bottom). The story of the opening of Japan was the basis of Stephen Sondheim and John Weidman's Pacific Overtures. Actor Richard Boone played Commodore Perry in the highly fictionalized 1981 film The Bushido Blade. The coming of Commodore Perry's ships was indirectly part of a plot in one of the arcs of the anime series Rurouni Kenshin and in the first episode of Hikaru no Go. Another anime series in which Perry briefly appears is Bludgeoning Angel Dokuro-Chan. The manga Fruits Basket also refers to the event while the main character is studying. The anime Sayonara Zetsubou Sensei also depicts Commodore Perry as a "troubled foreigner who isn't satisfied by opening ports and needs to open everything". The anime series Samurai Champloo, in an episode entitled "Baseball Blues", depicts a fictional character named "Admiral Joy Cartwright" whose fleet has been challenged by Kagemaru (secret agent and former ninja) to a baseball (Yakyū) game in order to prevent the establishment trade relations. The character is named after Alexander Joy Cartwright ("the father of baseball") and modeled after Commodore Perry. In Jikkyō Powerful Pro Yakyū 2011, Perry is the final boss of the game's success mode after the player unifies Japan. Perry's visit is also mentioned in the 1965 Hideo Gosha film Sword of the Beast. Popotan has several references to Perry throughout the series. The 2010 NHK Taiga drama Ryōmaden, which deals with the Bakumatsu period, portrayed Perry as a menacing, steadfast military commander who was able to subjugate the then-seemingly invincible Tokugawa shogunate through blunt negotiation. He was played by Timothy Harris. In the 2013 NHK Taiga drama Yae no Sakura, which deals with the Bakumatsu period, he is portrayed by Steven Ashton. Perry is the main antagonist in the Code Geass alternate universe manga "Tales of an Alternate Shogunate". He uses Geass to force Japan to open its ports, but does so on unequal terms and oppresses Japan, much like Britannia did in the original series. He faces opposition from Zero and the Black Knights, as well as from Princess Euphemia and Suzaku after they realize that he is trying to make Japan his own property, and he is ultimately defeated and forced to surrender. He pilots the "Black Ship", a flying ship that can transform into a combat robot. Two designers, Charles and Ray Eames, made a short film titled The Black Ships (1970). It depicts the opening of Japan with Japanese prints and drawings from the time. In the 2012–2013 Japanese anime, Bakumatsu Gijinden Roman. Man believed to be Admiral Perry, returns to Japan ten years after his last historical visit. In this fictional portrayal he commands a high-tech Ironclad, with the ambition of conquering the country for himself. The Nintendo DS game, Ganbare Goemon: Tōkai Dōchū Ōedo Tengu ri Kaeshi no Maki, features an antagonist named Peruri, who comes to Japan to conduct foreign trade, but the people were afraid of him. He was later met by a person named Sakura, who promises to help him if he helps him obtain the three Weapons of the Heavens. The anime Dagashi Kashi on episode 11 shows a short story of Perry bringing Lemonade to Japan as trump card to force the Japanese to open their borders for trade which works out but the Japanese mispronounced "Lemonade" as "Ramune", therefore creating Ramune. ^ Copes, Jan M. (Fall 1994). "The Perry Family: A Newport Naval Dynasty of the Early Republic". Newport History: Bulletin of the Newport Historical Society. Newport, RI: Newport Historical Society. 66, Part 2 (227): 49–77. ^ "BBC – History – William Wallace". Retrieved 2016-05-14. ^ Phillipson, Mark. "PhpGedView User Login – PhpGedView". www.clayfox.com. Retrieved 2016-05-14. ^ Genealogies of the Raymond Families of New England, 1630–1 to 1886: With a Historical Sketch of Some of the Raymonds of Early Times, Their Origin, Etc. Press of J.J. Little & Company. 1886-01-01. ^ "National Register of Historic Places : Quarters A : Commander's Quarters, Matthew C. Perry House" (PDF). Pdfhost.focus.nps.gov. Retrieved 2015-03-09. ^ J. W. Hall, Japan, p.207. ^ W. G. Beasley, The Meiji Restoration, p.88. ^ a b The Perry Mission to Japan, 1853–1854 – Google Books. Books.google.com. Retrieved 2015-03-09. ^ The Economic Aspects of the History of the Civilization of Japan – Yosaburō Takekoshi – Google Books. Books.google.com. Retrieved 2015-03-09. ^ Arms and Men: A Study in American Military History – Walter Millis – Google Books. Books.google.com. Retrieved 2015-03-09. ^ Black Ships Off Japan: The Story of Commodore Perry's Expedition – Arthur Walworth – Google Books. Books.google.com. 1982-01-01. Retrieved 2015-03-09. ^ "Commodore Matthew C Perry". mymexicanwar.com 2012. Retrieved December 15, 2017. ^ "Commodore Perry's Expedition to Japan". Ben Griffiths 2005. Retrieved September 12, 2009. ^ "Matthew Calbraith Perry (1794–1858)". Find a Grave. Retrieved January 9, 2011. ^ "Monument to Commodore M.C. Perry - View Article - NYTimes.com" (PDF). The New York Times. Retrieved 2015-03-09. ^ a b Tsustsumi, Cheryl Lee. "Hawaii's Back Yard: Mighty Mo memorial re-creates a powerful history," Star-Bulletin (Honolulu). August 26, 2007. ^ Broom, Jack. "Memories on Board Battleship," Seattle Times, May 21, 1998. ^ "The Black Ships (1970)". IMDb.com. Retrieved 2015-03-09. Arnold, Josh Makoto (2005). Diplomacy Far Removed: A Reinterpretation of the U.S. Decision to Open Diplomatic Relations with Japan (Thesis). University of Arizona. Griffis, William Elliot (1887). Matthew Calbraith Perry: a typical American naval officer. Cupples and Hurd, Boston. p. 459. ISBN 1-163-63493-X. "Diplomacy Far Removed: A Reinterpretation of the U.S. Decision to Open Diplomatic Relations with Japan | Bruce Makoto Arnold". Academia.edu. 1970-01-01. Retrieved 2015-03-09.